We’re announcing our first step in response to the changes in the USPS tabbing regulations. We have added the 1.5 inch tab capacity to our KT tabber. Every KT sold from now on will have the ability to switch from a standard 1.0 inch tab to a booklet friendly 1.5 incher. Now, you don’t have to break the bank to handle a few booklet jobs, you have the KT. We’re suggesting a retail price of $3500 contact your local dealer to order. If you don’t have a dealer nearby, call 866-430-2874. If you already own a KT – and thank you, many do – we are offering an update program. You can take advantage of this program through your dealer (recommended) or through the factory. Either way, we’ll do a couple of things to your existing KT. First, we’ll go through it and call you with a list of worn out parts that we recommend changing while we’ve got it apart. We won’t make any changes for cosmetic reasons – this ain’t no beauty contest. Then with your approval, we’ll upgrade and repair your machine with the new parts needed to run the 1.5 inch tabs. AllForMailers.com is taking the KT upgrade to the next level and,, well adding an easy button! For $800 we will ship you a KT Carton to make sure your tabber is not damaged in shipping! Place your Tabber in the box, without any accessories, and place the return service label on the box! Yes that’s correct the $800 covers UPS ground shipping and insurance both ways! We will even cover the 1st $50 in additional parts. 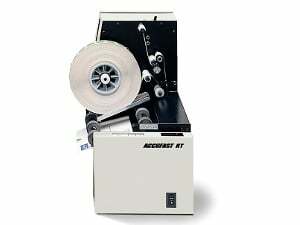 The Accufast factory will proform the upgrade, and contact us if the additional parts needed goes over $50. If the total upgrade costs with shipping goes over $800 we will contact you. If the total is under $800, we will refund your credit card. Ready to get started on your KT Upgrade and a shipping box on it’s way? Not interisted in upgrading!? Trade it in for credit tourds an New KT1.5! Call 866-430-2874 for all the details!